Lunch Packing for 2, 4, or 28. Here's How! - MOMables® - Good Food. Plan on it! Lunch Packing for 2, 4, or 28. Here's How! - MOMables® - Good Food. Plan on it! 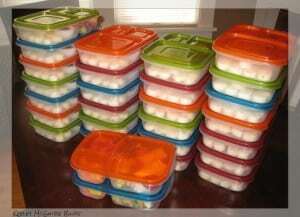 >> Lunch Packing for 2, 4, or 28. Here’s How! 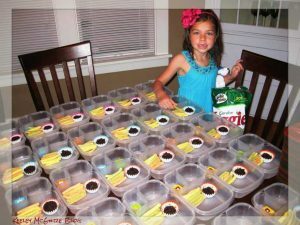 Would you get overwhelmed if you had to pack lunches for 28? Don’t worry, I don’t pack this many every day, but I’m going to show you how easy it is to pack lunches for 2, 6, or 20! I recently volunteered to make lunches for a school that is in the poorest, most-diverse neighborhood in the entire county. The thought of making 28 lunches could seem daunting, but I’m here to tell you, with a little preparation and helpful ideas from the MOMables menu plan, it went very smoothly! My daughter and I always bake together on the weekends. This allows me to be prepared and have ready-made snacks and breakfast items that will suit her gluten-free diet. We baked up a batch of chocolate chip mini zucchini muffins. They were perfect for a treat in the lunches for the school! A small amount of time baking = easy, healthy treats for desserts, whether for just your family for the week or to share! Not to mention the bonding time in the kitchen, as well as it being educational teaching fractions and how to read recipes. We also made MOMables-style Pinwheels for the lunches. A flour tortilla, cream cheese, oven roasted deli turkey, and roll! Little Miss and I prepared these the night before because they are simple to make. Tip #1: Set up an assembly line for each step. Instead of making each individual pinwheel, make all of them at the same time. 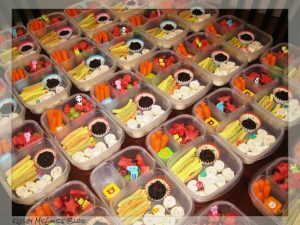 By spreading all the lunch boxes out on our dining table, we were able to quickly fill the EasyLunchBoxes containers with Veggie Straws, fruits, and carrots with dip. Tip #2: Sandwiches, wraps, pinwheels, and many other items are easier to slice cleanly after chilling for at least an hour—or until the next morning. 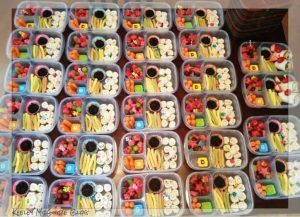 Thanks to my MOMables subscription, making lunches every day for my daughter takes minutes! If I can do it for 28 people, anyone can do it for their family! Having a plan, a shopping list, and a make-ahead tips section saves a lot of time! Tip #3: Make lunches ahead of time. Most menu items give tips on keeping the items fresh and reheating suggestions. If you’re able to prepare your menu items, say Sunday afternoon, it can save you time and energy during your busy workweek! Tip #4: Incorporate leftovers. 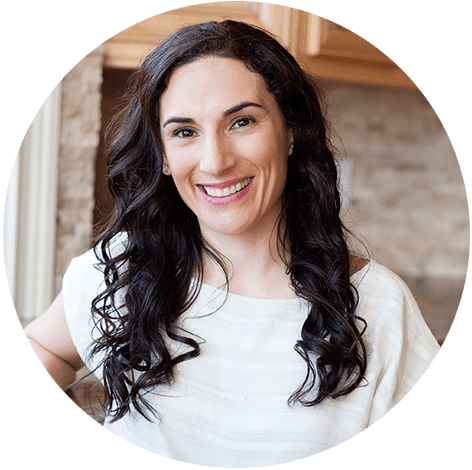 Another reason MOMables saves me time and money is because they tell me in the menu if I will need chicken, rice, or pasta for a menu item. I can easily cook it at the same time I’m making dinner for my family! Healthy lunches for 1 or 28, it all comes down to planning! Let MOMables help you get the most out of your time and energy so your family can have the lunches they deserve. Tip #5: Plan year-round. 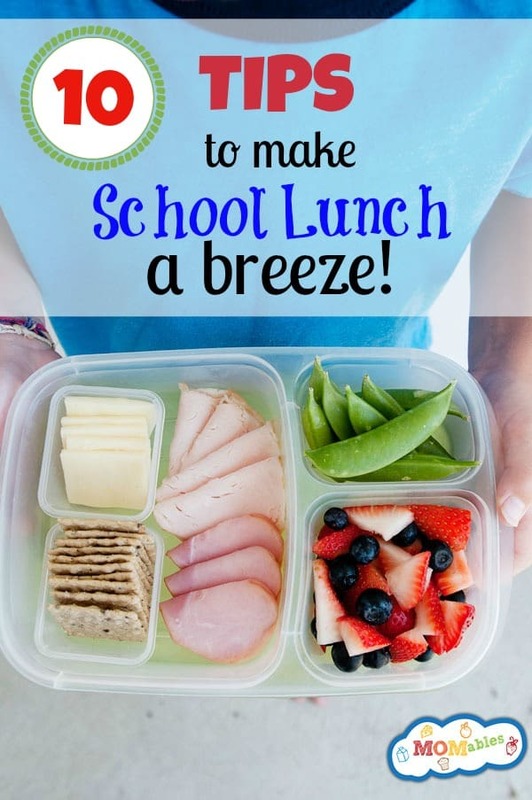 Just because it’s summer doesn’t mean your kids aren’t eating lunch! Even with hectic summer schedules, fresh is still best. Between June 25th and August 10th, MOMables will share three fresh dinner ideas and two lunch options your family will love. Planning during the summer helps avoid costly convenience foods and unhealthy drive-thru meals. As always, your weekly download will be filled with prep-ahead tips, five meals and a convenient shopping list. Where did you get those containers? Including the little dip ones. Such a great work you do! Thank you Amber! The “little” containers are muffin cups but they don’t have lids. I really love the “mini dippers” from EasyLunchboxes. Browse through our Amazon store and you will find them in lunch box essentials.. Thank you! we wanted to show that ANYTHING is possible when you plan!